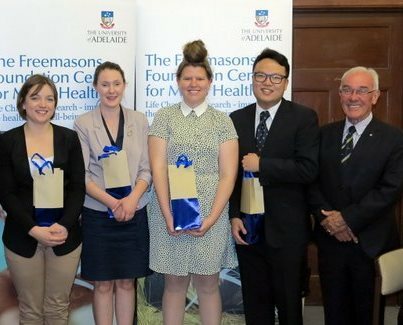 At the dinner following the Annual General Meeting of the Freemasons Foundation, Chairman Mr Don Sarah AM presented the Centre’s Honour’s Scholarship students with gifts to congratulate them on their outstanding achievements. Amber Lawson: First class honours (Graded in top 3 Honours students for School of Medicine). Appointed to Graduate position at the Australian Bureau of Statistics, Canberra. Topic: Men’s health services; Supervisors: Prof G Wittert, Prof D Turnbull. Dania Ruminski-Smith: Awaiting result: Selected to represent Centre at the 2015 Student Research Showcase at the South Australian Health and Medical Research Institute. Contract position with host laboratory. Topic: Obesity and male sub-fertility/sperm health; Supervisors: A/Prof M Lane, Dr N McPherson. Camilla Trenerry: First class honours. Podium presentation at International Skin Cancer Conference 2016. Topic: Increasing uptake of skin cancer screening by farmers; Supervisors: Dr K Fennell, Prof C Wilson. Joule Li: First class honours (Graded in top 3 Honours students for School of Medicine). Podium presentation at the National Diabetes Conference, Best oral presentation at the South Australian Men’s Health Research Symposium. Supervisors: Prof G Wittert, Dr S Martin. Nathan Harrison: First class honours. Topic: Farmer-targeted psychological support information. Supervisors: Dr K Fennell, Prof C Wilson. Contract position at tQEH, Psycho-Cardiology clinical trial. This entry was posted in News, Research and tagged honours, scholarships. Bookmark the permalink.